Looking for a good book to help you kick off your email marketing campaign or just in need of some inspiration? You’re in luck! In this post, we’re bringing you four great books that we think every email marketing professional should read. Some of them have stood the test of time for as long as 78 years. Take a look at our suggestions below and get reading! In the book Seth Godin argues that the traditional models of TV, radio or print advertising are based on interrupting customers and forcing them to see your advertising. This model is becoming less viable due to saturation of consumer’s attention with up to 5,000 ad messages a day. The better approach, according to Seth, is sending personal, relevant messages to people who are waiting to hear from you. He dubbed this model permission marketing. It’s a process that begins with looking for people who are interested in what you have to offer. You ask for their permission to talk to them regularly, often by giving them an incentive for giving their permission. Then, you send those people exceptional educational content over time. Gradually, as trusts develops, you can start asking your customers for more and more information on their needs. Once this trust is established, asking for a sale is mere triviality, because you know what your customers want and they trust that you’ll deliver on your promises. This process mirrors the process of opt-in email marketing, and it’s why email is the channel Seth advocated for permission marketing. Once a person signs up to your newsletter, you have permission to send your messages right into their inbox. Unlike social media, you own your email list or “permission database” in the words of Seth Godin, rather than renting it from Facebook or Twitter. These advantages show in the returns on email marketing. Permission marketing is not a short-term tactic. It’s a strategy that requires investment in time and resources in order to create high quality incentives to subscribe to and keep reading emails. However, this investment will often deliver handsome returns, particularly if the lifetime value of a customer is high. 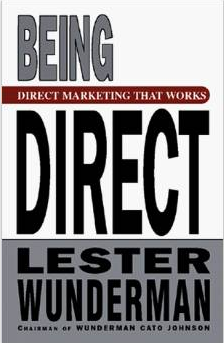 The popular books written by Lester Wunderman are today considered to be must-reads for every self-respecting marketer. There are several reasons why Being Direct make our list. Firstly, because it’s a journey in the mind and life of a great marketer, told in a casual and autobiographical way. Listening to the experiences of the man behind the American Express customer rewards program and the Columbia Record Club is like a course on marketing in it itself. Secondly, you can still apply his lessons in a faster and more connected ecosystem.Wunderman’s idea of direct marketing is based on two mains principles: people are an end, never a means; and direct marketing is data driven. In short: you should always address the precise needs of your customers – needs that you will know thanks to your data-driven strategy – and never impose what you have to offer. These simple ideas seem obvious for most of today’s marketers. However, they are more and more relevant. Thanks to the new tools the digital revolution has given us, such as online forms and surveys, online shopping and stores, automatically generated discount codes, it’s become easier to manage the sending of personalized messages that will genuinely interest the recipient, leading to conversion and retention. Online marketing was the logical next step that direct marketing was waiting for: the inconvenience of maintaining a huge personalized list of contacts or geographical constraints are no more. And its creator tells us that we should expect more to come from the digital turn of marketing. We learn that what we fear as consumers is true: subliminal messages work. There are mirror neurons in the brain that drive us to imitate actions of those around us. In retail, we want to buy the lifestyle that models are portraying through the clothes they wear or the cars they drive. In politics, fear-based advertising is much stickier in our memories than a message that brings hope. Lindstrom arms both consumers and marketers with the takeaway that branding will become ever more important in the coming years. As consumers we’re given the knowledge to rationally dissect the messaging we see, and as marketers, the science behind how your audience will react to messaging. 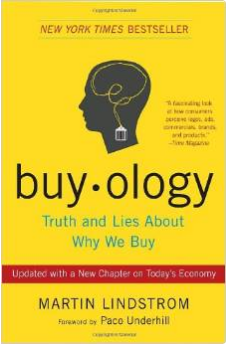 At 272 pages, Buyology is a fun, thought-provoking and educational read. While it might not seem like the most obvious choice, this classic from 1937 provides universal and timeless advice on one of the big challenges we all face: dealing with people. For email marketers, the challenge is often to understand your audience in order to address it in an appealing way, thereby convincing it to take action. And Carnegie provides tips and ideas on how to do just that. The book is based on management classes that Carnegie held in 1912 and draws on the experiences shared by his students, as well as quotes and anecdotes from historical figures such as Henry Ford, Confucius, and Shakespeare. 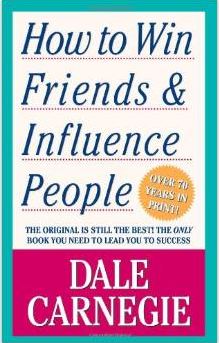 Throughout its 4 main chapters, the book’s overall message is that in communicating with others, we all need to understand the person or audience we’re talking to in order to approach them in the right way. This is highly relevant to email marketing as well, since newsletters and marketing emails must be targeted at a specific audience in order to convey a message that is effective and appealing. Don’t be fooled by the quirky title. How to Win Friends, which has sold more than 15 million copies since it was first published in 1936, is packed with advice that is both inspiring and useful. Not just in your role as an email marketer, but also as a communicator in any kind of scenario.